Massively big guns on the Mighty Mo. Pearl Harbor and the USS Arizona Memorial may be the main attraction (and free), but I cannot stop telling everyone that they need to also visit the USS Missouri. Mighty Mo is HUGE. There is so much to see and learn and I found myself imagining young men mopping the decks, running back and forth inside the ship’s maze of rooms and walkways, and living life the best they could in a time when “war” was a very real entity. You don’t have to be a history buff or a ship nerd to love the experience on the Battleship Missouri. There’s something for everyone and the entire walkthrough and information available is very well done. I was even wiping away tears while reading letters – it was that real. Tickets are $29 for adults and $13 for children. It’s pricey, especially for a large group, but certainly worth the money. You can choose between a 35-minute docent-guided tour or an acoustiguide that can last from 45 to 120 minutes depending on your preference. I chose the docent tour and it was just long enough that I didn’t get bored or fall behind. They take you to 3 points on the ship (bow, stern and surrender deck), give a short speech on facts and history and you’re free to ask questions and wander. There’s a small building to get your acoustiguide and just past that is where everyone gets sectioned off into groups for their docent tour. The process is quick and docents are aplenty. My group was about 15 – 20 people, led by Jared who knew his stuff and answered all our questions. The Battleship Missouri is actually located on Ford Island, so access is restricted to those with military ID. Most of you will have to park at Pearl Harbor and catch the shuttle. The shuttle comes often and is only about a 15-minute ride from Pearl Harbor to Mighty Mo. Local Tip: The shuttle travels round trip. That means when you leave, your next stop will be the Pearl Harbor Aviation Museum before you head back to Pearl Harbor. It takes about 5 minutes to get to the Aviation Museum and about another 15 minutes to finally make your back to Pearl Harbor. Right before the line for the guided tours, you’ll see the souvenir shop, snack stands, eating areas and even a permanent food truck serving plate lunches. Keep in mind that most people stay here for 2 hours (I stayed for 3 hours!). The bathrooms are closer to the entrance where you got off the shuttle bus. The men’s and women’s bathrooms are on the left of the many American flags at the entrance. Definitely use it before you start the tour because you’ll be in a bind if you’re exploring the belly of the ship. Local Tip: Bring a water bottle with you to keep you hydrated. They have water stations where you can fill up your bottle. I made the mistake of not drinking any water all morning and did not think to bring water with me. Upon exiting, I bought a cold shave ice and slurped it down like water. Very satisfying! Admiral Chester W. Nimitz keeps watch as you make your way to the Battleship Missouri. This was by far my favorite part of the whole Mighty Mo experience. I went at my own pace and the deeper I traveled, the more I understood about what a life at sea meant. Dorms, mess halls and bathrooms aren’t the only things to see in a ship this size. There were dental offices, mail rooms, offices for each department, rooms devoted to all manners of communication, private bedrooms, lounges, cafeterias, snack shops…it was like a small town packed underground. I spent almost 2 hours down here exploring each room and strolling through every walkway. You have almost full reign down here to wander and luckily there are arrows to point you in the right direction. Each room was labeled and it boggles my mind imagining the number of men it took to fill each position. There were desks, chairs and various office equipment like any normal cubicle. Not to mention all the beds that were required to house these guys! You can peek into every room and they’re all set up as if they’re ready to use. I could easily imagine men in uniform standing in line for their food, sitting at desks doing paperwork or sorting mail and passing them out to eager young men waiting impatiently. Local Tip: I was glad to find out that there’s AC down here – a pleasant surprise especially since the outside deck gets really hot. I can only imagine how hot and humid it must have been back then. A mess hall for the inhabitants of Mighty Mo reminded me of old McDonald's seats. Here’s a good reason to choose a guided tour with a docent rather than an acoustiguide: the way each docent describes the ceremony puts everything into perspective. Verbally, they set the tone of what this moment meant for not just the U.S., but for the whole world. It meant there was a winner and a loser. The fighting stopped and the catastrophic death tolls stumbled to a halt. In a few short minutes, the world was listening with all ears. And soon after, the world shifted suddenly and drastically toward a different direction. There’s a neat plaque that indicates where Admiral Nimitz signed the documents and the docent will point out where everyone else was standing on the deck. I especially liked the story about the pens Admiral Nimitz used – 6 pens that went to different people. Now that’s what I call a souvenir! Local Tip: You’ll see a backward, old American flag displayed in a frame nearby. Ask your guide about it and take a close look at the stars! Viewing a photo of the moment of surrender while standing on the Surrender Deck of Battleship Missouri. Hawaii Activities may have occasional discounts on different Pearl Harbor or USS Battleship Missouri tour combos. You can also book tickets directly on their site. If you know you’ll absolutely love this tour, there’s an upgrade called the Heart of Missouri Tour. It’s $54 per adult and I’ve heard that it’s worth it for those who really love these types of museums and how ships work. You don’t have to bring water, but I recommend bringing an empty bottle so you can refill it at their water stations for rehydration. You’ll be doing quite a bit of exploring. I went at my own pace and wore tennis shoes, which was fine. Keep in mind that most people will spend 2 hours here. I spent 3 hours by myself checking out every nook and cranny. Plan your food/drink times accordingly because you can’t eat on Battleship Missouri. I suggest taking a rest (if you need it) when you first walk downstairs to explore inside the ship. 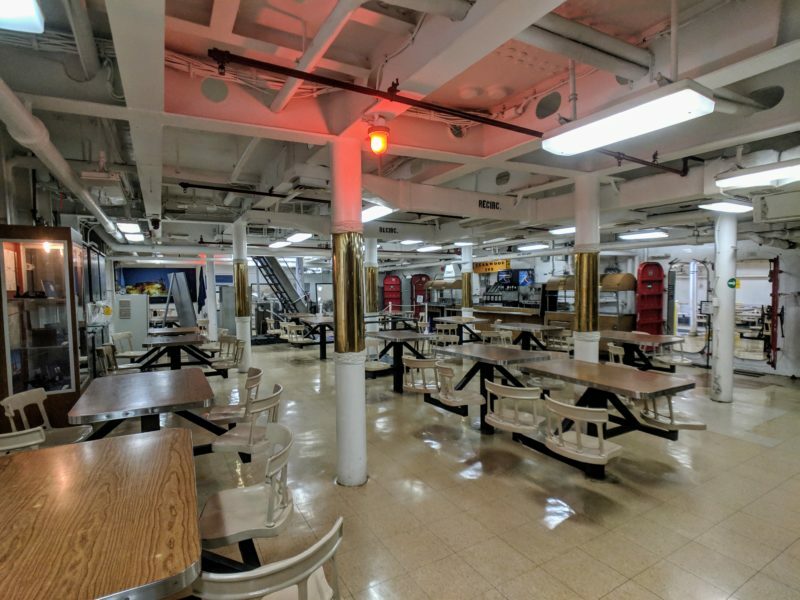 There are several tables and chairs (mess hall style) that you can sit on and you won’t really have another chance to sit throughout the rest of the ship. This isn’t a great tour for someone who has difficulty walking. While there is an elevator that can take those with disabilities from the main deck to the surrender deck, I didn’t see any accommodations made for the inside of the ship, which I think is half the fun. Some stairways are quite steep – watch your step. In particular, the entrance and exit stairways connecting the main deck and below should be climbed with care. When you first climb below deck, there’s a small area dedicated to the Japanese kamikaze pilots that sacrificed their lives for their country. These were young men who knew they were going to die – they volunteered for it. Due to the secrecy of the Dec 7, 1941 attack, they weren’t allowed to write home until just before they gave the mission a go. There are a handful of letters here that were written in a rush and here’s where I spent a good amount of time tearing up while reading each letter. I found it to be a very unique part of the Battleship Missouri displays. To see lives on the “other side” so deeply affected gives a whole new meaning to the definition of war. I Recommend The Mighty Mo Tour! If history is your thing, this tour will be a highlight of your trip. The best part is that it isn’t your typical museum layout with pictures, descriptions and displays (although there’s some of that here, too). 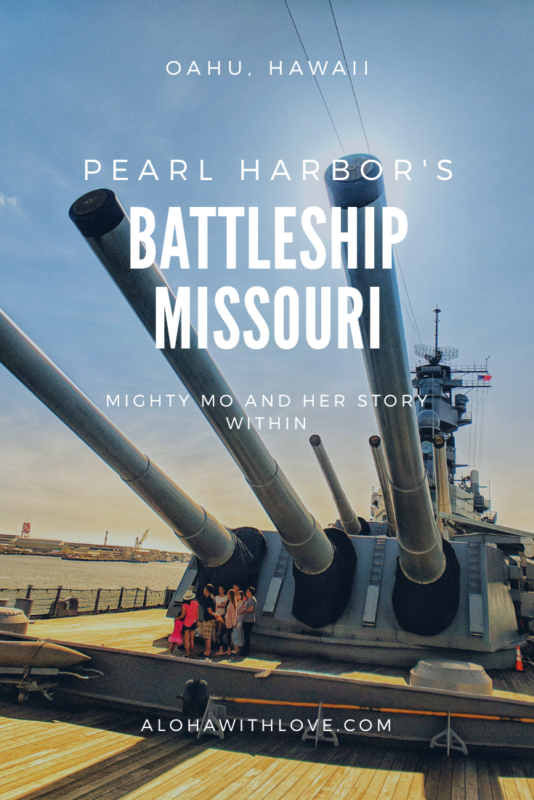 Instead, Mighty Mo offers an interactive experience where you can put yourself in the shoes of the young men who called Battleship Missouri home. It offers not just a WWII history lesson, but also a slice of life at sea. 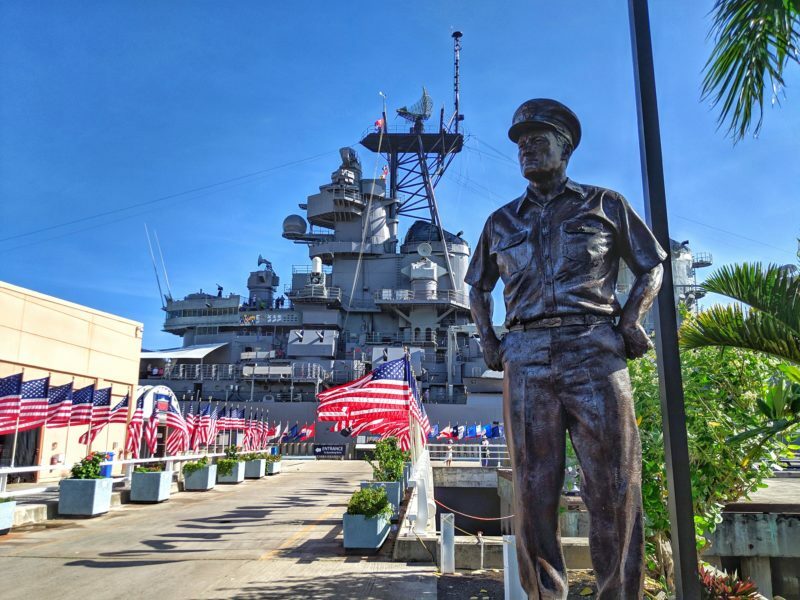 If you enjoyed this post on Battleship Missouri and plan to visit Hawaii someday, sign up below to get my local Hawaii tips. It’s free and I can’t wait to help you plan the perfect Hawaii vacation.